NEW! SIGG Water Bottles at YURTOPIA! SIGG bottles are manufactured in an ecologically-friendly environment and are 100% recyclable after their very long lives. In fact, most SIGGs in Europe are still being used 10-20 years after purchase. More info on SIGG bottles click HERE. Click HERE to purchase your SIGG bottle from YURTOPIA! Dymaxion Deployment Units, "DDU's", created in 1940-41 and filed for patent in March of 1941, DDUs were first designed for British military use. 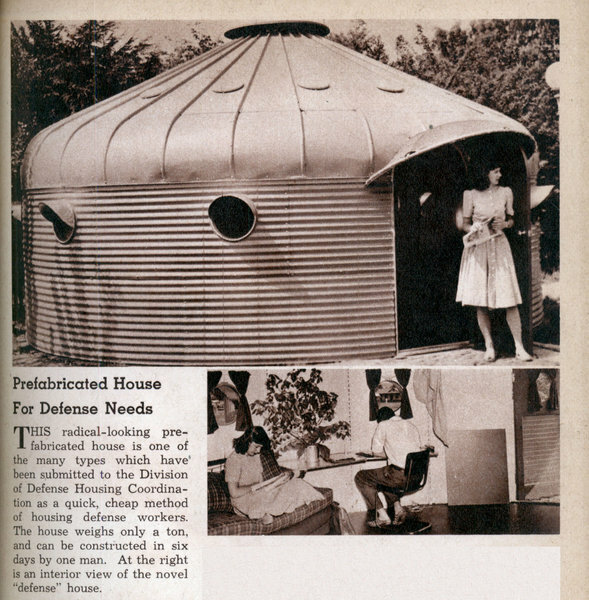 Used by the American military after Pearl Harbor, they were loosely based on the construction principles first publicized by Fuller’s “Dymaxion house” in 1927. “Dymaxion” was a word coined by Fuller to express his principle of maximum function for minimum effort. The dymaxion house, based on this principle, was a pre-fabricated circular construction supported by a single central mast (Buckminster Fuller Institute 1995; Klotz 1988; Roth 1979). The DDUs had circular walls and a unique domed metal roof, with a ventilator at the central apex. This design had the specific purpose of creating a warm-air thermal outside the building, together with a corresponding cool air draft pulled groundward in the middle. The ventilator served to pull this downward draft of cooler air into the DDU. This natural air-conditioning was just one of the unique features of Fuller’s DDUs (Buckminster Fuller Institute 1995).” (Reed and Swanson 1996 Pg. 17, 19). This photo of "astonished" Mongolian women viewing our Yurtopia store was found on Flickr and sent to us by email. Check it out HERE! TEN years ago, Michael Roach and Christie McNally, Buddhist teachers with a growing following in the United States and abroad, took vows never to separate, night or day. By “never part,” they did not mean only their hearts or spirits. They meant their bodies as well. And they gave themselves a range of about 15 feet. Their partnership, they say, is celibate. It is, as they describe it, a high level of Buddhist practice that involves confronting their own imperfections and thereby learning to better serve the world. Ms. McNally said, “From a Buddhist perspective, it purifies your own mind.” Ms. McNally is 35 and uses the title of Lama, or teacher, an honor not traditionally bestowed on women by the Tibetan orders. Their exacting commitment to this ideal of spiritual partnership has been an inspiration to many. In China and Israel, and in the United States, where they are often surrounded by devotees, their lectures on how laypeople can build spiritual partnerships are often packed with people seeking mates or ways to deepen their marriages. They hope their recently published book, “The Eastern Path to Heaven,” will appeal to Christians and broaden their American audience. “There is a tremendous amount of opprobrium by the Tibetan monks; they think they have gone wacky,” said Robert Thurman, a professor of Indo-Tibetan Buddhism at Columbia University. 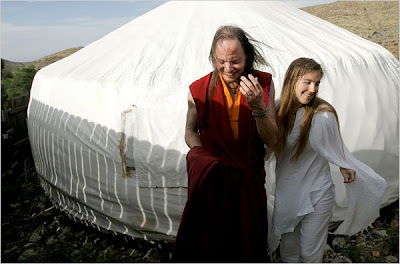 Professor Thurman, a former monk himself, describes himself as a friend and admirer of Mr. Roach, and said that after the geshe made his relationship with Ms. McNally public in 2003, he begged him to renounce his monastic vows and to stop wearing the robes that mark him as a member of a monastic order. Mr. Roach declined, and the two have not spoken since. The yurt in which Mr. Roach and Ms. McNally live when they are not traveling the world (which is often about half the year) sits in the high desert some 100 miles east of Tucson, on a platform overlooking a rift in the cactus-speckled hills. For 100 acres around, the land is the property of Diamond Mountain University, an unaccredited school that Mr. Roach founded with Ms. McNally in 2004 to teach Buddhist principles and translation skills. Although devoid of modern conveniences, the yurt they live in, which is 22 feet in diameter, feels almost luxurious compared with the spare, desiccated landscape around it. On one side of the tent is their double bed, and beside it a commode elegantly disguised as a wood side table. The floor is covered with carpets. A few carved wooden chests hold clothes and pillows. Created by Jennifer of The Felt Mouse, this is the first and only (as far as I know!) 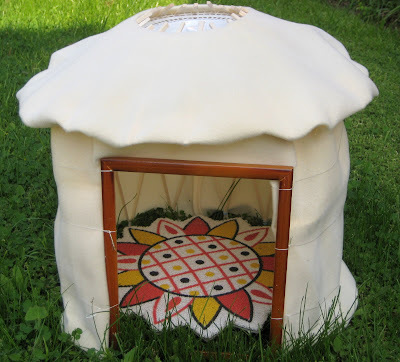 Yurt just for Dogs! 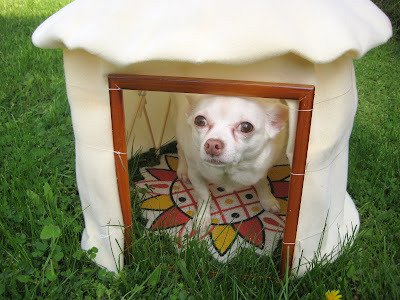 Made for less than $10 as part of the Dollar Store Challenge from Crafster.com, the do-it-yourself doggie yurt is sure to make your best friend drool.... Read more about it in Jennifer's Blog. 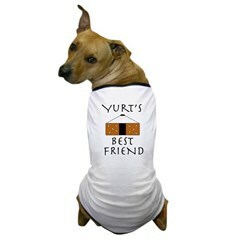 I don't know about you but I think Jennifer's pooch, Chuy, might need a doggie Yurt Shirt from Yurtopia to wear in his new Yurt!